The foot of the one-leggèd chorister hurts even more than those of us with two legs. 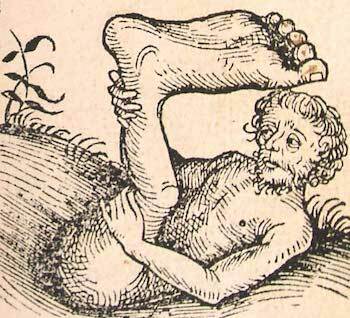 This fellow is from a section of the 1493 Nuremberg Chronicles — written by Nuremberg doctor and humanist Hartman Schedel and illustrated by Michael Wolgemut and Wilhelm Pleydenwurff — describing odd peoples of the world. I’m standing on my riser, shoulder to shoulder with my fellow choristers. During rehearsal, I thought we had a little more room; now it seems we have all become slightly swollen for the performance, and I cannot move in any direction without accidentally leaning on my neighbors. I am trying not to rest my music on the head of the person in front of me, and I can tell, by the regular rearrangement of my hair, that the person behind me is having a similar struggle. In spite of the fact that I’m wearing my ugliest and most comfortable black shoes, we’re only one song into the piece and already my feet hurt. It is hard, at times like this, to keep my mind from wandering to thoughts of my new performance piece. It is written for 40 conductors and a single chorister. The chorister stands on a large, raised platform, where she has plenty of room to move around as the music demands. She has a stand so she doesn’t have to hold her music, and so she can give her full attention to the conductors. They stand on risers in front of her. Since there isn’t enough room to accommodate music stands, they are asked to hold their scores with one arm while conducting with the other. This obviously isn’t ideal, but fortunately there are enough of them to divvy up the task. One section conducts the beat. Another leads dynamic changes, and yet others are in charge of onsets and cut-offs. They can have a committee meeting later and decide who does what. In the meantime, conductors, please make sure you can see the chorister; you may have to shift a little to have clear sight lines. I realize it’s very crowded. Please do your best not to hit each other. This piece is 60 minutes long. Smile with your eyes! If I were a better person, perhaps my hurting feet would not lead me so quickly into fantasies of vengeful performance art. Alas, I am deeply flawed. But here’s the thing: I spent years as a chorister trying to find shoes that were comfortable enough that my feet wouldn’t be in agony by the end of the concert. This was before I understood how the sensory receptors in the foot work. We have sensory nerves (also called mechanoreceptors) throughout our bodies that send feedback to the brain about things like movement, pressure, and vibration. The feet have a lot of them. Slow adapting sensory receptors, on the other hand, will continue to send a signal as long as the stimulus is present. This type of sensor is very important in the foot, because, among other things, it enables us to maintain our balance while standing and walking. If you’ve ever had the experience of trying to walk on a foot that’s “gone to sleep,” you know just how bad it can be when these sensory receptors go offline. As choristers, when we are standing on risers, crowded enough that we can’t even shift our weight from one foot to another, the slow adapting sensory receptors in the foot will send a continuous signal to the brain, and before long, that message will be: “Ow. Ow. Ow. Ow. Hey, you’re still standing on me. Ow.” Comfortable shoes will help distribute the pain evenly over as much of the foot as possible, but they won’t do anything to change the essential nature of the mechanoreceptors in the foot. In my fantasy piece, even though both the chorister and the conductors are standing for the same amount of time, the chorister’s feet don’t hurt. She has enough room to shift her weight from one foot to another without bumping into someone or having to worry about blocking the view for the people behind her. The conductors, on the other hand, crowded on their risers with no room to move, are starting to have trouble focusing on their music as their feet clamor for relief. They may start making silly mistakes, missing cues, or getting off of the beat. So what’s a conscientious choir director to do? A little extra space goes a long ways. When we shift our weight from one foot to the other, our whole body shifts so our weight is over the standing leg. Depending on the size and stance of the person, the head can easily shift between 4 and 8 inches to one side. That extra room means you won’t bump into your neighbor or block the view of the person behind you. Got a big choir and not quite enough space? Gospel choirs have figured this one out! Everyone shifts from one foot to the other together. Sing some gospel tunes! Got a big choir and not enough space and you’re not singing gospel music? I just invented a new notation for you! We notate breath marks and consonant placement for cut-offs in our music. Why not coordinated shifts from one foot to the other? 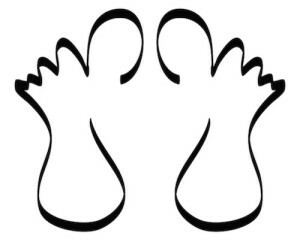 New symbols to be added to the music notation lexicon, indicating weight distribution through left and right foot, respectively.